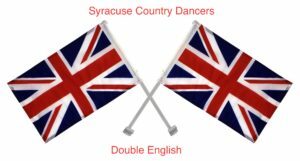 Each year in September we offer a “Double English” dance. 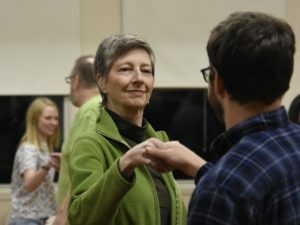 There is an afternoon session of English country dancing designed for those who welcome some challenge and want to dance without instruction in basic skills. This is followed by a potluck supper and our regular evening English country dance. The 2018 Double English was held September 1st at our Fayetteville location. We enjoyed exquisite music by the band Sister Haggis — Eileen Kalfass on fiddle, and Jane Knoeck on piano. A group of six regional callers of English country dance shared the calling, a true panoply of regional talent! Save the date for the 2019 Double English: September 7, 2019. You are welcome to come for 1, 2 or 3 parts of the event in any combination that works for you!